unfashioned creatures: Upcoming paper: "Fairy Tale Heroine or Fables Superspy? Finding the Real Cinderella"
Upcoming paper: "Fairy Tale Heroine or Fables Superspy? Finding the Real Cinderella"
In four days (eep!) I'll be co-presenting a paper I've co-authored at a conference I've co-organised (with many other organisers that have done far more work than me). 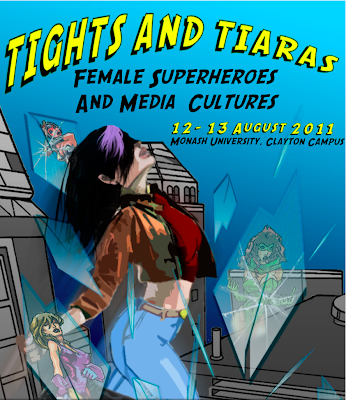 This Friday and Saturday is Monash University's Tights and Tiaras: Female Superheroes and Media Cultures, a conference put together by the Sidhe Literary Collective, the feminist reading group I've been part of for the last few years. The keynote speaker will be Karen Healey, an award-winning author of young adult fiction who has been very active in the feminist criticism of comic books. We've got a stack of amazing-sounding papers lined up, and I can't wait! Below is the abstract of my paper, which I co-wrote with Rebecca-Anne Do Rozario, an academic from Monash's School of English, Communications and Performance Studies. It's titled "Fairy Tale Heroine or Fables Superspy? Finding the Real Cinderella" and we'll be looking at the evolution of the character of Cinderella from fairy tale to comic book. The superspy Cinderella is an important character of Bill Willingham’s ongoing Fables comic book series, and has even earned two spin-off miniseries of her own, written by Chris Roberson. In this incarnation of Cinderella, the fairy tale heroine pursues a career of international espionage, undertaking dangerous missions for the good of her fellow fables, all the while parading as a simple shoe-store owner pining over the breakdown of her marriage to Prince Charming. The tales of Perrault, the Grimms and Disney have shaped the contemporary popularity of Cinderella, emphasising the heroine’s journey from ashes and housework to tiaras and handsome princes. These popular tales, problematised by easy misogyny and patriarchal expectations, have overshadowed earlier versions of the Cinderella story, in which the heroine attacks her despised stepmother and beheads ogresses. By examining some of the early cunning and feisty incarnations of Cinderella, including Basile’s “The Cat Cinderella” and D’Aulnoy’s “Finette Cendron,” this paper will examine how the fairy tales’ interests in costume, masquerade and general sneakery have been readily absorbed into the comic book medium. It will also consider Cinderella’s portrayal in the Fables series and the two Cinderella miniseries, and the high and low points of her depiction at the hands of the creative teams behind these comic books. Durand and Leigh call superhero stories “the next step in the fairy tale tradition,” and once we strip the patriarchal trappings from the early tales of Cinderella, the character can bridge this transition and sit as easily upon the shelves in a comic book store as upon Mother Goose’s tongue. Tights and Tiaras - conference success!